Blue state American males have declared war on BBQs, claiming that they are instruments of the patriarchy and must be abolished. “Women will never know equality so long as men enjoy grilling meat,” says aristocratic journalist Richard Von Smidt the 3rd. “Men should know that the pleasure they derive from BBQs is built on the oppression of women. The fact that grilling meat is considered a masculine activity means that it’s oppressive and must be abolished." Many Canadians agree. 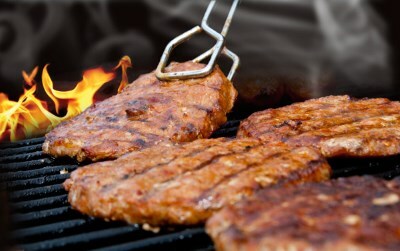 “BBQs are manly, and manly is evil” says Condoria University Professor Molly Rosewald, “It’s time for Canada to say no to grilling meat. I call on the Canadian government to pass a law that mandates that all BBQs be replaced with either chocolate fondues or eating a woman’s placenta while howling at the moon. Both of those are suitably feminine activities that will help purify Canada of the patriarchy." Montreal’s Angel Park used to be home to countless outdoor BBQs, but these days men who grill meat in public will likely find themselves pilloried by angry mobs of twitter users. “If I see someone grilling in public, I alert my twitter followers and we organize a flash mob to shame the grillers into leaving the park,” says human rights activist Pearl Neglass. “We need to reclaim our parks from those who would sully it with masculine activities. Down with BBQs! Down with grilling meat! Kill all men!" Not everyone is on board with banning BBQs. “I don’t know what the hell happened over the last couple of years, but suddenly everyone’s lost their mind,” says BBQ aficionado and meat lover Clay Texan. “I like grilling meat. I like BBQs. I like doing manly things. And yet all these emasculated twerps from Massachusetts and New York and San Francisco are defecating all over the internet with their silly nonsense. Oh, BBQs are sexist. Buzz off. BBQs are awesome, everyone can enjoy them, and men who like grilling don’t have to feel guilty about it, no matter what the smug pricks with English Lit degrees from Harvard, Yale, or Cornell say."